Power sector is a key contributor to economic growth for any country. On one side utilities have to meet the growing electricity demand and on the other side they have to adopt to new regulatory requirements. On the other side consumers are also expecting real time and transparent information from their utility. Utilities, therefore, are adopting the digitization to be part of a ‘Digital Energy Network’ to become more efficient for themselves as well as for their consumers. Smart metering is one such digital initiative which is being driven by the Government of various countries. Smart meters are the electronic devices which can do a two-way communication with the back end systems. Smart metering will become a game changer for both utilities and consumers. The real time information from the point of delivery will help Utility and Consumer to manage the electricity consumption in a much better way. In these discussions one crucial and important point generally takes a back seat and which is about the new business processes which will get evolved. More importantly, these new processes will co-exist with the existing processes till the time smart meter roll out process is over for all the consumers. Hence, it is vital to think of a bigger picture which covers end to end business processes. After smart meter and communication set up, utilities are talking about MDM (Meter data management) solution only. It is envisaged that the MDM will interact with HES (Head end systems) and not only store the meter data but also perform new business processes like prepaid meters and consumer portal. In almost all cases, Utilities must be using some CIS application to perform metering, billing, collection and customer service processes. Therefore, it is quite important to have an integrated system which is lean and utilize existing CIS application instead of building one more application. SAP carries a rich experience in handling such complex requirements and solving them in a simple way. We are thought leaders in Smart Metering and already helping leading Utilities to create roadmap for ‘Smart meter rollouts’. 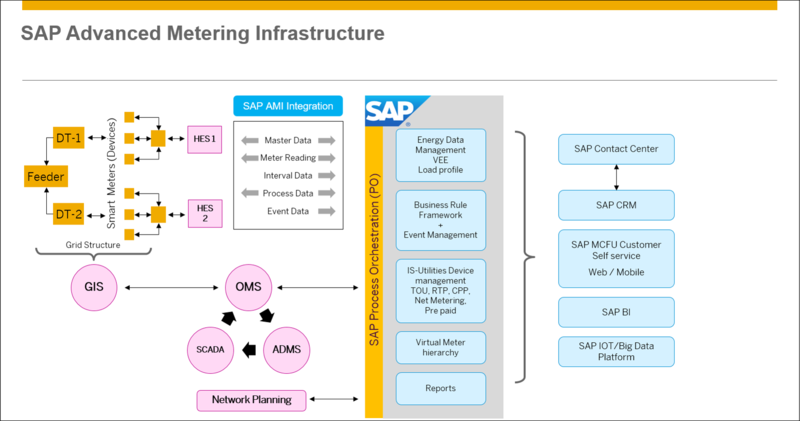 SAP’s ‘Advance metering infrastructure’ will help Utilities to integrate with smart meters via Head end systems along with managing the underlying business processes. Let us work together and make your smart meter roll out a successful initiative.